Below is a detailed comparison of these three pool types, including the pros and cons of each. You can check out our guide to general pricing for the three pool types. Below, you'll also find the most comprehensive library of fiberglass pools vs. vinyl pools vs. concrete pool articles found anywhere. Let's discuss this chart for a moment. As you can see, fiberglass swimming pools have some substantial advantages over vinyl and concrete, but there are some disadvantages as well. Why are fiberglass pools so easy to maintain? It all has to do with surface porosity. The surface of a fiberglass pool, called the gelcoat, is virtually non-porous. In contrast, the surface of a concrete pool is extremely rough and porous. These rough cavities and pores give algae a place to hide and call home, making pool ownership much more difficult. Concrete pool builders teach their clients that weekly brushing of the entire pool surface is mandatory to keep algae at bay. In addition, chemical usage in concrete pools is much higher because of the need to penetrate the pool surface to kill algae. For these reasons, fiberglass swimming pool owners typically spend 75% less time and money maintaining their pools. This means anyone who owns a fiberglass pool will spend more time in the pool and less time maintaining it. Because the fiberglass pool shell is manufactured off site, the installation of the shell typically occurs in about two days. Compare this with three to six months with a concrete pool, and we're talking about a huge difference in the duration of time your yard is in disarray...and often the difference between swimming this year or waiting until next summer. Because fiberglass swimming pools have no liner, there's no need to concern yourself with puncturing the pool surface. Vinyl liners are not cheap...often upwards of $4–5k to replace. This can happen from dogs getting in the pool, tree branches, patio furniture blown into the pool, etc. Fiberglass pools are incredibly strong and durable, so there's no need to be concerned about damaging the pool during daily use. Over the past 30 years, fiberglass inground pools have transformed from the typical white bathtub you'd find at a rental beach house, to the elegant swimming pool designs and aesthetic features that are now as much works of art as the pool. This is due to advancements in the industry such as beautiful colored finishes, ceramic tile, tanning ledges, water features, stunning pool lights, elevated spas, poolside walls, etc. 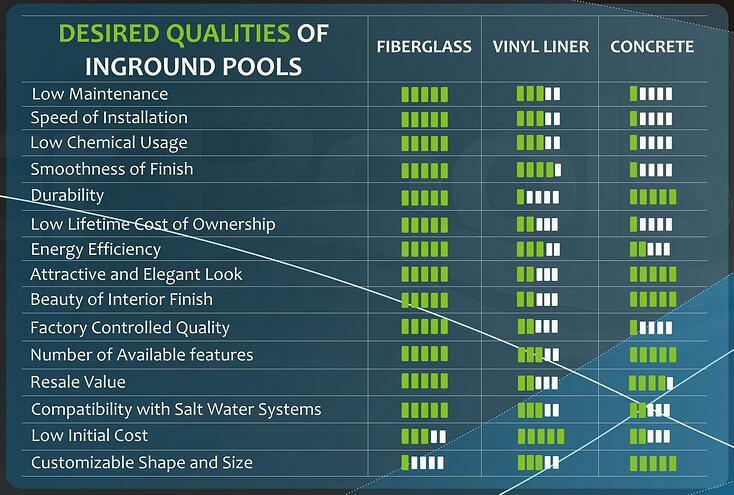 This is one of the many reasons why fiberglass pools have gained exponential market share over the past decade. Salt chlorinators have proven to be a low maintenance, high water quality option for pool owners. However, if you have ever seen what de-icing salt does to the surface of a sidewalk, you can guess what it does to the surface of a concrete pool. In our opinion, this makes the combination of salt systems and concrete pools unfavorable. Also, many vinyl liner pools are constructed with metal wall panels, and most have aluminum coping around the perimeter of the pool. This is also a terrible scenario for a salt system. The liner will eventually leak, meaning good-bye wall panel! In comparison, fiberglass pools and salt systems go together like peanut butter and jelly. With no adverse effect on the fiberglass shell, you can enjoy the low-maintenance benefits of salt with confidence that your pool is not compromised. If a pool comes with the property, home buyers want something that looks good, needs little maintenance, and will last a long time. Vinyl liner pools need a new liner every 5–9 years, and often a buyer will require the current owners to replace that themselves. Vinyl liner and aboveground pools don't look great, either, and can detract value. By contrast, a fiberglass pool adds to the value of your home. Low-maintenance beauty and durability are a win-win for both parties. Although it won't recoup the original cost of the pool itself, it does help...and the greatest value is the joy that the pool brings you and your family. The initial cost of fiberglass is a bit more than a vinyl liner, usually $45,000 to $85,000. However, as you can see from the chart above, you spend far less in the long run when factoring in the cost of liner replacements every 5 to 9 years. The one major disadvantage of fiberglass inground pools is that you can't change the shape, size, or depth of the pool. So the question then becomes, can you find a fiberglass pool model that you're happy with? We've found that about 90% of people do find a fiberglass pool that perfectly meets their needs. However, if you need a pool that's 10 feet deep or an ultra customized shape, fiberglass probably isn't the best fit for you. As you noticed in the first chart above, concrete pools give you the ability to customize the shape of the pool. This is far and away their greatest virtue. This is perfect for those wanting an extremely deep or large pool, or a pool with custom tanning ledges (which are also available in fiberglass) or other custom features. Like fiberglass pools, the structure of concrete pools are incredibly durable. There is no concern with dog use or fear of damage to the pool interior from sharp objects like with vinyl liner pools. However, concrete pool finishes, although tough, don't last as long as the gelcoat surface of a fiberglass pool. By its very nature, concrete is extremely porous. This gives algae a place to call home. Once embedded into the surface of a concrete pool, algae is extremely tough to remove. In fact, concrete pool builders recommend brushing the entire surface of the pool with a steel brush at least once a week to remove any algae that is on the surface. Water chemistry is another issue with concrete pools. Because the algae embeds into the surface, more chemicals are required to reach and destroy it. This requires more time and money to maintain the pool. Also, concrete is alkaline-based which constantly increases the pH of the pool water, requiring the regular addition of acid to keep it in balance. As mentioned earlier, salt and concrete don't mix. The dissolved salt in the pool water will shorten the life expectancy of the interior finish of a concrete pool. Thus it requires more frequent refinishing. As demonstrated in the chart above, concrete pools cost exponentially more money to own. They cost the most upfront: $50,000 to $100,000 or more. Acid washing by professionals every three to five years, more money in chemicals, more money spent on electricity, and refinishing/remodeling all add up to tens of thousands of dollars more over the years. The rough interior of a concrete pool does harbor algae growth, but that's not all. It can take a toll on tender feet as well. In fact, most kids who play in concrete pools on a regular basis have to wear water shoes to protect their feet from becoming sore and blistered. In contrast to fiberglass and even vinyl liner pools which can be completed in several weeks, it's not uncommon for concrete pools to take three to six months or longer to finish. Construction takes a toll not only on the backyard, but on the family as well. 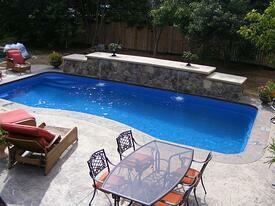 Vinyl liner pools are more affordable to install, usually $35,000 to $65,000. This, their most appealing attribute, allows many families to enjoy the benefits of an inground pool that couldn't otherwise fit it into their budget. Despite the fact that the vast majority of vinyl liner pools are rectangular, it is possible to customize the shape, size, and depth of the pool. Custom shapes do cost more, but still typically less than your average fiberglass or concrete pools. The following video show a not-so-old vinyl liner pool transformed into a stunning fiberglass pool. The biggest disadvantage of vinyl liner pools is the cost and frequency of replacing the liner. 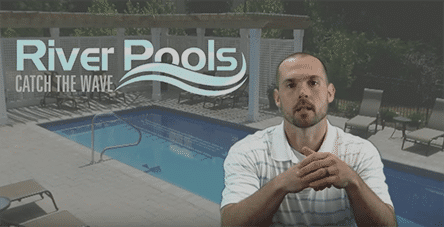 Today's vinyl liners will typically last between five and nine years at an average cost of around $4,000 to replace when factoring in the cost of the liner, labor, water to fill the pool, and other minor expenses that tend to come up. 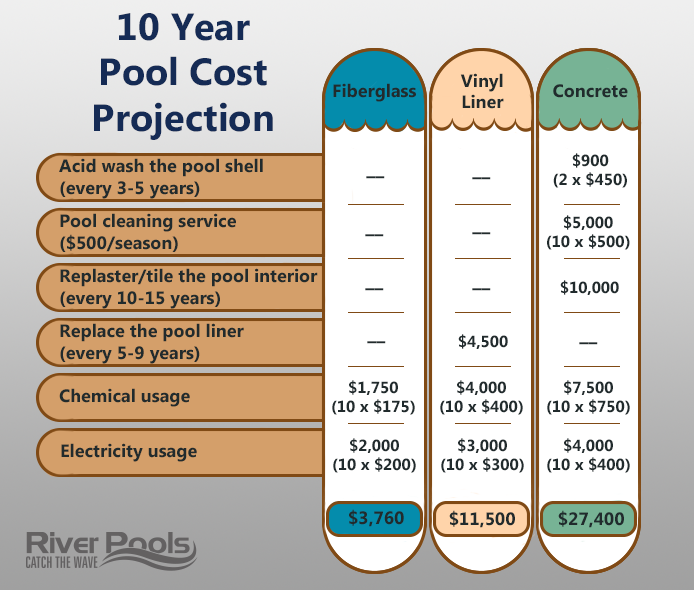 This means the low initial cost of the pool could be off-set within the first ten years after construction...and over the entire lifetime of the pool, it will cost many thousands more than a fiberglass pool in the long run. Another point of discussion is the liner warranty, which is typically stated as twenty years or so. The warranty only covers the "seams" of the liner, where the sections of material are fused together. The warranty is extremely pro-rated. You'll most likely get some credit toward a new liner during the first two or three years, but next to nothing after that. The surface of a vinyl liner pool is relatively non-porous. However, parts of the pool like where the white plastic steps attach to the pool wall, and behind light niches have submerged areas that do not have circulated water. Consequently, algae grows in those areas and spawns new algae growth. You can also get an easy online quote for a fiberglass pool. Looking for more info? You're in luck! Check out the following articles and videos from our archives. The Ultimate Guide to Fiberglass vs Concrete vs Vinyl Liner Pools! Concrete, Fiberglass, or Vinyl Pool Fading: Which Fades the Worst? How Long Will Vinyl Liners Really Last? The Crazy Buying Decisions People Make When Debating Fiberglass vs Concrete! Fiberglass Pool Owners: Never Tell Your Friends with Concrete Pools These 5 Things! Can Concrete Pools Float: Crazy Pictures! Editor's note: This page was updated on October 30, 2018.